Forrester research shows that there’s increased spend in SEO. They were on the rise before the recession and now marketers are really looking to acquire at lower rates than placed search. Google has 72% of the search traffic in Latin America. Most popular markets are auto, travel…and other things on the slide that I didn’t get. What if you don’t optimize your site? Your boss will want to know why you’re not showing up in the SERPs. Your brand and your online growth will stagnate and die. Qualified visitors will go to another website to find info and services. Research how YOUR audeicne searches for YOUR information and services. Get inside your user’s head. 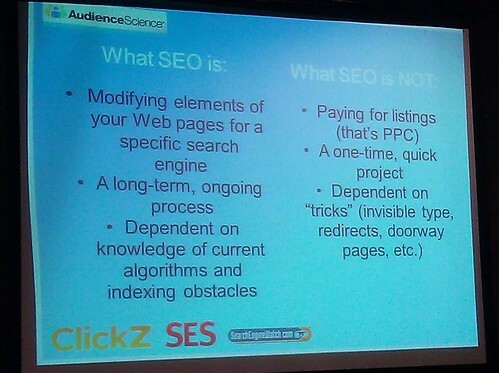 Understand what they see on the SERP (the description). Make it accurate, compelling, competitive. Manage what they’re seeing. How are they looking for your information? Analytics programs – are there high-quality terms dryving traffic that needs to be optimized for growth? Don’t use jargon. Think like a user. Choose terms with appropriate levels of competition for your site. Who are your users — Humans and spiders. Building for humans will be good for engines too. Label it so that you can incorporate keywords. Optimize daily if you can. Test, test, test. 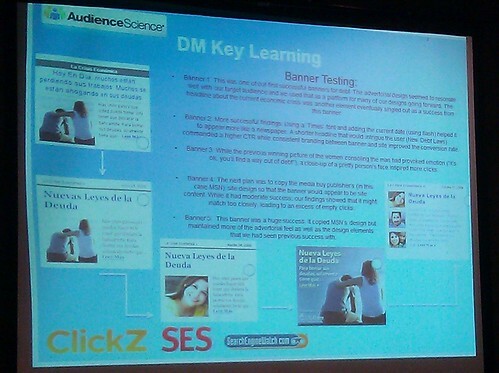 They went through five banners that all looked very different to figure out what worked for their audience. 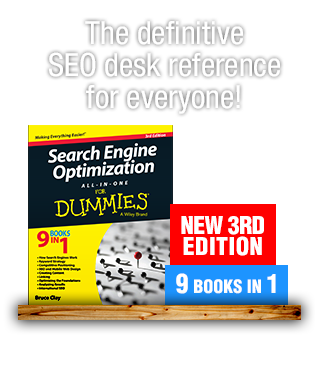 Supplement SEO with PPC for deep experience with major search engines and all aspects of keyword optimization. In this case, used SEO to develop their PPC keywords. Think Globally and act Locally. Use regional TLDs. Separate your Spanish and English content in Subdomains/folders. Do not duplicate your content. Avoid Query string parameter or session variables. Language – Portuguese and Spanish. How does your audience think and search online? How do they expect to find your content? Pay attention to regional variation. Server – it’s not that important to have a local IP but it is nice to have. Links – get local links. Links are your site’s vitamins. Social-defined relevance: People I know found this content interesting. Sharing is the new linking and search engines are beginning to use our social graph to define personal relevance. Content is not only king it’s president and prime minister as well. 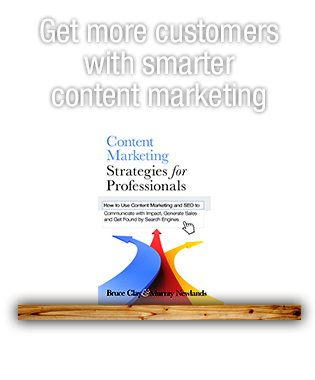 Create unique content worth sharing and linking. Latinos love to share and Latinos love great content. Videos, infographics, thoughtful posts, incredible photos. Latinos like to use more words to say the same thing. How do you target US Hispanics? What language do you use? Matias: It depends on the budget. If you have all the money in the world, target by country of origin/ethnicity and have a linking strategy for each. Now, if you have a limited budget, go with a more generic approach. Use words that work well across many cultures. Rafael: Colombian Spanish on the East Coast tends to work better, it’s the most “generic” for those groups. On the West, it’s more complicated. California requires one approach and a third for the rest of the country. More lingo in the West. It also depends on the age. 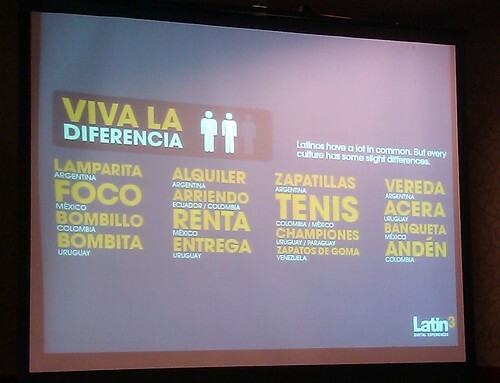 Matias: There’s also “Spanglish” to consider. It’s not just the Latino market. The young urban Latino is more mixed. Do they search in Spanish or English or a combination? Should you target Spanglish? 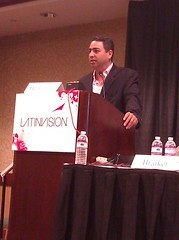 Rafael: We mostly use English terms when we’re reaching the fluent Hispanics. First generation Hispanics do require Spanish. Cost of keywords are going up with more demand for Spanish keywords. Matias: We start with a PPC campaign as KW research to see where the demand is. If people respond to Spanglish, we use that, etc. Bilingual section about tech: People are enthusiastic about the notion of Spanglish — do they want content about Spanglish or in Spanglish. Rafael: My gut reaction is that they’re searching in Spanglish for Spanglish language content. Can we send other countries to our Chilean site? Matias: You should host in Chile and have your TLD. But you should have a separate site for each country. [Rafael makes a “separate them” motion with his hands] Have subfolders if you can’t have a separate site. Rafael: Make sure you buy the domain even if you’re not using them so no one else takes them. What about mobile and iPads? 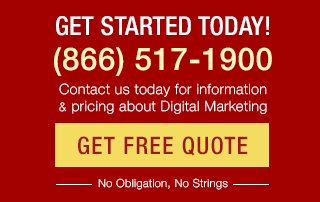 Do you change your SEO strategy? Matias: It’s the same. Google is starting to show better results. Make sure you have a good linking strategy with other related mobile sites. Rafael: It used to be they needed different sites but now they can be basically the same. Again mentions having a good linking strategy. If I’m a US company targeting US customers, do I get other TLDs/countries? Matias: No. Have the Spanish language content in a subfolder but you don’t want to rank in Chile or Mexico, you want to rank here. Base your linking strategy here as well. Matias: Use the Spanish language keyword in the URL. .es is Spain, .mx is Mexico. Get the right TLD for your audience.